361 Degrees Running is the newest brand of running shoes to hit the US market. Other brands have tried to break into the running market only to fade away after a few seasons. Who remembers Avia, KSwiss, and Pearl Izumi? Then there are brands such as Zoot and Newton that rode a small wave of popularity and have retreated in market share never regaining their former luster. There have been a few brands that have succeeded. Hoka being the best, recent example. Brands such as Merrell, Salming and Altra seem to be gaining traction within various segments of the running category yet would still be considered niche brands. Will 361 Degrees Running go the way of K Swiss? Will they become a Newton? Will 361 Degrees grow to take on Hoka, New Balance, Brooks or Saucony? Whatever happens the addition of 361 Degrees Running to the US market makes this shoe category more interesting. 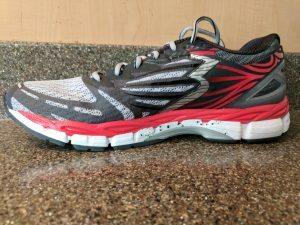 We are going to review the 361 Degrees Sensation 2, then compare it to several shoes and talk about how/where 361 Degrees Running may position their line in stores. 361 Degrees was started by two shoe veterans, Otto Lin and Jim Monahan with support from the international brand 361 Degrees. Out of this collaboration Quickfoam was developed. Quickfoam is a blend of EVA and rubber encapsulated in polyurethane. Quickfoam’s claim is “consistent cushioning and comfort.” The Sensation 2 is a stability shoe weighing in around 11.5 oz. Neither the lightest nor the heaviest. and I suspect they could shed some weight with a reduction in upper materials. The insole is a blend of Quickfoam with a Quickfoam midsole and 9mm of drop. There is a TPU plastic bridge to provide more stability in addition to the medial posting. The outsole is blown rubber and has flex grooves running across the forefoot. The big question with any shoe is how does it run? I found the Sensation 2 to be comfy firm, comfortable yet not hard, firm but not rigid or stiff. The medial posting is there yet does not hinder the transition from landing to toe off. The shoes felt good on their first run, flexible but not flexy. Over 100 miles later they still feel good. There is no feeling of break down or loss or responsiveness under any part of the foot. My right shoe tends to take a beating under the ball of my foot due to pronation and after 100+ miles there is no noticeable compression. 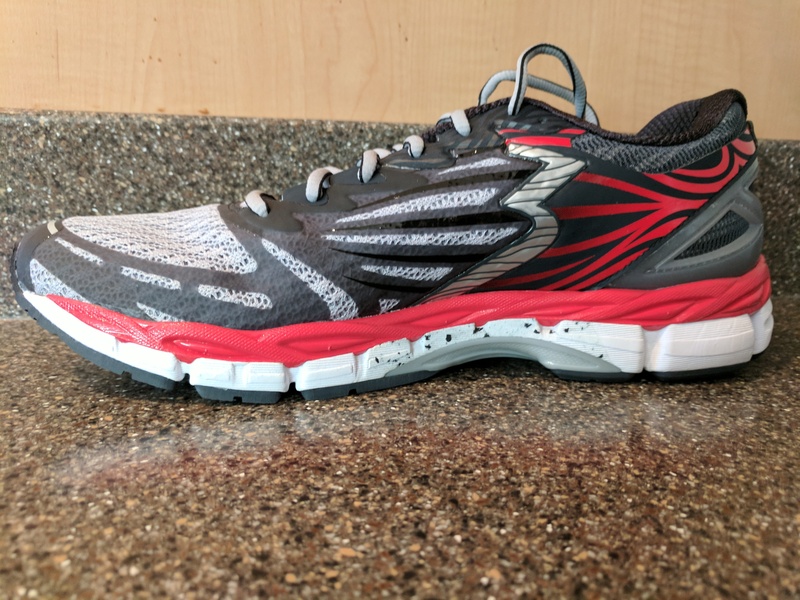 The outsoles show almost no wear even though they are blown rubber and I run on asphalt and an abrasive sand/dirt packed trail. There have been no blisters or hot spots regardless of how thin or thick my socks were. The wet surface traction is great, no noticeable slipping or sliding at any point through the gait cycle on wet roads. 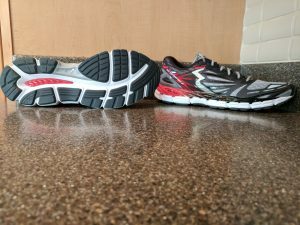 Having never run in a 361 Degrees Running shoe before I wanted to compare it to other shoes. 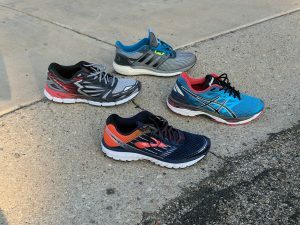 I ran the Sensation 2 against every stability shoe in my stable including the Asics GT 2000-6, GT 3000-5, Kayano 24 and New balance 860 V7. In the neutral shoe category I ran it against the Brooks Ghost 9, Adidas Supernova and Asics Cumulus 18. I’m sure my neighbors were scratching their heads watching me run up and down the street over and over again wearing two different shoes. Or by now maybe they just think it’s normal? The 361 Sensation 2 feels most like the Asics GT line. That is probably not a surprise given the team behind this shoe. I’d put the 361 Sensation 2 on par or maybe slightly ahead of the Asics GT 2000-6 for cushioning and stability but with a smoother transition from landing to toe off. The GT 3000 feels more slightly more cushioned, and has a bit more length to the medial post. The Kayano 24 is firmer and with more stability although here again the Sensation 2 has a smoother transition from landing to toe off. The New Balance 860 is the firmest shoe and has the most noticeable medial posting of any shoe in this write up. The transition from landing to toe off is on par with the 361 Sensation 2. If you compare the Sensation 2 to the neutral shoes, the Adidas Supernova is firm and soft at the same time while the Sensation 2 is comfy firm. These two shoes feel completely different from each other and yet both are very comfortable. 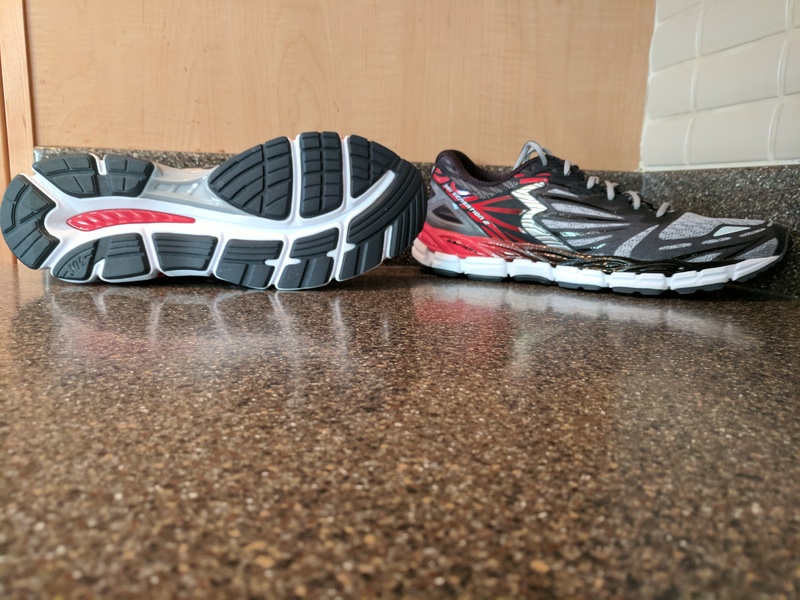 The Ghost 9 has comparable cushioning and firmness, the Cumulus feels a bit more cushioned but the 361 has a better transition through the gait cycle. The 361 Sensation 2 is a very solid, day in day out training shoe. Firm, no sign of breakdown, minimal wear on the outsole and as comfortable at mile 101 as mile 1. It’s one of two shoes handling 90% of my running and it’s replaced some of my former favorites as a daily training shoe. The biggest issue 361 Degrees will have is getting shelf space in your local running store (LRS). If the rest of the line is as solid as the Sensation 2 these shoes will sell. If you are an established LRS you will predominately sell through your core brands. Asics, Brooks, New Balance and Saucony in some mix come to mind as must have core brands. Adidas and Hoka could help anchor your wall also. Nike will draw people in the store but they’ll leave with something else on their feet more often than not. Then you need 1-2 niche/specialty brands like Merrell, Salming, or Altra for the trail, ultra runner, zero drop, low cushioning, other non mainstream shoe crowd. If I was a new(er) LRS, or in a very limited floor space and/or low overhead space you could go the niche route + a couple of core brands. I think 361 Degrees fits perfectly in this strategy. With the Sensation 2 you are not giving up anything to Asics other than name recognition, at least at the GT 1000/2000 level and potentially higher up in their line. Then you bring in some combination of Altra, Hoka, Inov-8, Merrell, Mizuno and/or Salming + 1-2 core brands to anchor your wall. 361 Degrees has a veteran team and it’ll be interesting to see how they go about penetrating the US running market. Thanks for the detailed review. I like your comparison between 361 Degrees and other shoes.